This is a cake that I have grown up eating and love. There is just something so comforting about the taste of the pineapples and the moistness of the sponge, it’s the perfect cake to accompany tea and coffee for last minute guests. It’s easy, it looks good and it tastes better. I know that some people use a yellow cake mix for this, but I personally have never tried it and always make my batter from scratch. You can use a standard cake tin but I personally prefer to use a springform tin and like the base with baking paper, the cake should slide right off either way. This recipe will be in 2 parts: the topping and the cake batter, it looks long but trust me, it’s extremely easy and quick. Preheat fan oven to 160C/ non fan 180C/ Gas 4. For the topping I am giving you 2 options, so you can choose which one you prefer. I have tried both but prefer the 2nd one. Cut your butter in small pieces and mix it with the sugar, then put it in your tin and leave in the oven for about 5 minutes or until the butter melts. 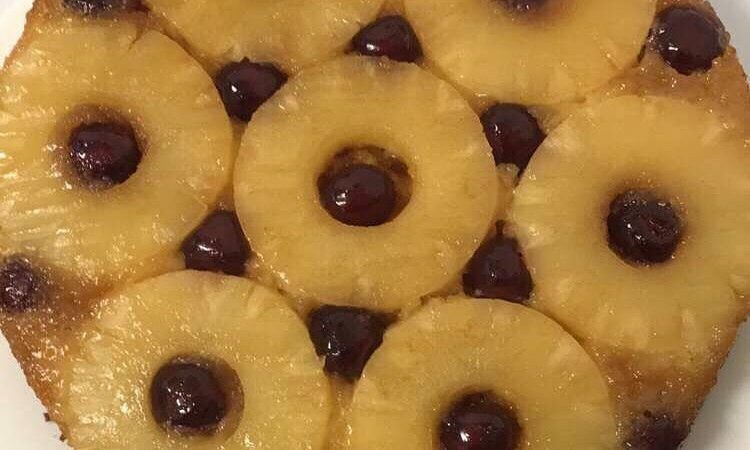 Once it has melted arrange the pineapple rings on it and put the cherries in the middle. Set aside. Cream your sugar and butter together, then spread it on the bottom and bottom edges of the pan, arrange your pineapples and cherries and set aside. Add all the batter ingredients in a bowl plus 2 tablespoons of the pineapple syrup then beat the whole thing until it’s smooth and throughly mixed. Spoon into the tin on top of the pineapple and with a knife smooth it out so it’s level. Bake for 35-37 minutes, and make sure not to open that oven door halfway through!! After 35 minutes it should be done but you can check it with a toothpick, insert it and if it comes out dry it’s done. Leave the cake to stand outside the oven for 5-10 minutes and then flip it on a plate. The pineapple side should now be on the top of the cake. Cut yourself a slice, add some vanilla ice cream to the side of your plate, put your feet up and enjoy. I love pineapple upside down cake but I’ve never tried to make it ! I think I will now though!